Young Kelly's mom doesn't understand about red. Sure, the brown mittens are warmer, but the red mitts make better snowballs. And the red boots aren't just for rain; they take bigger steps in any weather. And, yes! a green cup does make a difference � juice tastes better in the red cup. No doubt about it, red is best. 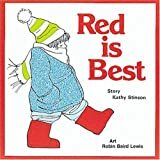 Kathy Stinson's classic tale of one toddler's obstinate color preference has been charming readers for 25 years now. With over 275,000 copies in print, Red is Best has steadily marched its way to become a children's book classic. Now a new generation of readers can discover Stinson's insistent young heroine, aptly captured in the simple drawings by Robin Baird Lewis, each punctuated by the right dazzle of red. With its plucky charm presented in a redesigned interior, and a special cover commemorating the book's 25th anniversary, the re-release of Red is Best is sure to be a red-letter day.